overall is 32 cms (12.5"), head diameter 20 cms.(8"). weight is 3.2 kg (7 lbs). re-enforcing raise ridge with ornamentation running down and across the brows, and nasal section. 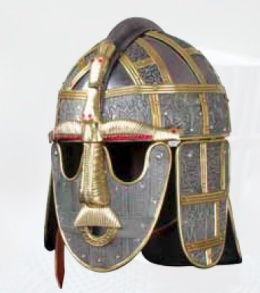 A beautifully constructed,high quality replica of the famous Sutton Hoo helmet. The original helmet, which experts date to be from the seventh century AD and to be of Anglo-Saxon origin, was found within a royal burial site near Woodbridge/Suffolk. This helm features: 16 gauge steel with brass and rivet and etched textural detailing, overall is 32 cms (12.5"), head diameter 20 cms. (8"), weight is 3.2 kg (7 lbs), hinged full face plate with eye and mouth cut out, hinged ear flaps, hinged neck plate, re-enforcing raise ridge with ornamentation running down and across the brows, and nasal section. This is a real show stopper. Sutton Hoo, near Woodbridge, in the English county of Suffolk, is the site of two 6th- and early 7th-century cemeteries. One contained an undisturbed ship burial including a wealth of Anglo-Saxon artefacts of outstanding art-historical and archaeological significance, now held in the British Museum in London. The ceremonial helmet is one of the most important finds from Sutton Hoo. This page was last modified on 8 June 2014, at 11:04.